I am pleased to announce that my novel, The Glory Rites, is now available in paperback on Amazon. You can access the site by clicking on the cover and blurb to the right of this posting. 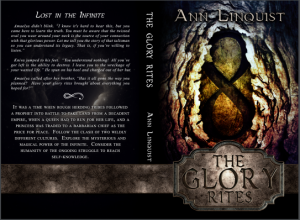 The prequel to The Glory Rites is being formatted for paperback right now. It is called The Old Powers. Coming soon! Are these fantasy novels? Yes, but…. I’m not much for dragons, magical creatures, and evil wizards. I’m more interested in psychological development, and these books follow the personal growth of several characters. I’ve used plots that pit the existence of otherworldly powers against the spiritual issues of religion and humanism. Do check out the Amazon site and consider ordering a book today. I’d really like to receive your review on the Amazon site as well. It’s your turn to give me feedback! Thanks, Gullie! Having the dang thing off my hard drive and into book form is quite satisfying. Congratulations Ann. I haven’t written in a while but have not given up the idea. I will look for a copy on amazon. Thanks, Sandra!! I hope you enjoy it, and it gives you food for thought. Keep writing! I’m so glad to hear this, MagicBird! Feel free to write me a review. It would be fun to be on the receiving end this time. I just ordered my copy. I can’t wait to read this one. Like I said before, you just might turn me into a reader ! You might have fun reading this one, Peanut. It’s even better than the first one! Thanks for the note, old friend. I bought the Kindle version. I sure hope the story features a vicious dog that’s covered in black ooze. All the really good stories have a dog like that. Anyway, good luck with the book and, of course, don’t spend the $10 all in one place. Well dang! I forgot the vicious dog, but there is actually quite a bit of black ooze. Does that count? You know, we’ve been trading remarks for a while now. When are you going to publish a compilation of all your good stuff? Congratulations, Ann! I look forward to reading it! I’m delighted that you will take a look. Enjoy!